Pressing CTRL+/ will insert or remove the slashes, based on whether the first line of the code is prefixed with //. You can keep your context, find the information you need, insert language element directly into your code, and even have IntelliSense complete your typing for you. Press "<" to create IntelliSense for HTML tags. Put cursor on HTML tag and press Ctrl+SPACE. Press SPACE to create IntelliSense for HTML properties or events. Put cursor on HTML property or event and press Ctrl+SPACE. Put cursor on Value and press Ctrl+SPACE. Put cursor on special character and press Ctrl+SPACE. Note, each HTML tag and attribute has own IntelliSense! Press SPACE or ENTER to create IntelliSense. Put cursor on ready property and press Ctrl+SPACE. Press Ctrl+SPACE to obtain IntelliSense. After entering a property or object, write dot " . ". Put cursor on ready object, property or method and press Ctrl+SPACE. Write method, which has some parameters, and type bracket "(". To obtain IntelliSense for statements and functions press Ctrl+J. 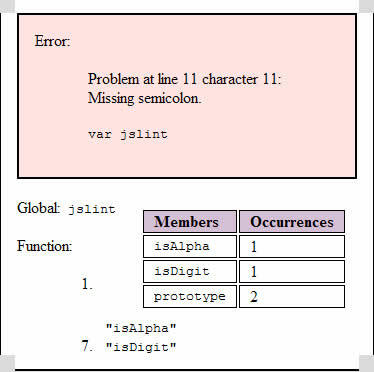 To obtain auto completion, write the first letters of statement (for example for function write func) and press Ctrl+J. Intellisense removes now the need to remember thousands of objects, functions, members, and properties. Just write the first two letters of your object to obtain IntelliSense. You can disable this feature by unchecking the "AutoIntellisense" option in then Preferences dialog. And even more! You can generate variable, which is assigned to some ID element and use it with exact IntelliSenses for that tag. Find functions and variables in your documents effortlessly - they are automatically listed. There are three ways to sort variables and functions: descending, ascending and none. Code formatter . If you employ some codes from external sources with dissimilar coding styles and standards you likely know how it is durable to read and maintain these codes. Using F11 and Shift + F11 you can rapidly navigate highlighted usages back and forth. Pressing ESC you can unhighlight highlighted usages. Access all these actions via menu EDIT --> USAGES. As web pages, for placing them on the Internet, or as RTF files, for use in Microsoft Word and other text processors. Distribute your colored code with ease. you should place a link to http://www.yaldex.com/ on any page of your web site.